Raised by parents who were classically trained musicians, artist Bob Pejman was surrounded and influenced by art and culture from an early age. It must have been the effects of listening to Italian and German operas during his childhood growing up in Vienna, Austria that somehow formed the basis for his passion and talent to paint romantic European scenes later on. "Music links directly to art", noted Pejman later. "Every era in western music history has a closely linked counterpart in a period in art". What is note worthy in most Pejman paintings is how his is able to overload a painting with a great magnitude of content without overwhelming the viewers’ visual senses. In fact, a typical Pejman painting is so rich in content that it can be broken down many counterparts and sections that would make individual paintings. One can view a major Pejman oil painting much like a classical music composition where there is a main theme and many other counter motifs and passages. In the musical analogy one must consider that the classical composers orchestrated a piece played by an orchestra of about 80 musicians while maintaining harmony and coherence. Such is done by Pejman in most of his painting compositions, especially his realistic paintings. Stylistically, Pejman is a classical painter. His earlier works, painted between 1994 and 1997 have an almost neo-classical quality. While the artist studied extensively with the Russian master, Anatoly Ivanov, he references Pre-Raphaelite master Sir Alma Tadema and Maxfield Parish among his most notable influences in this time period. Witness Pejman’s “Apollo & Daphne”, a 36"x48" oil painting that that was painted with strict adherence to the form and content found in 18th and 19th French classical paintings. 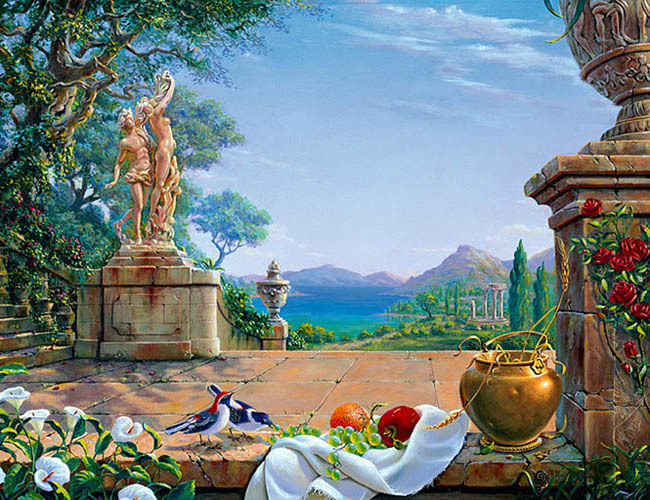 In this painting, a classical landscape serves as background to an almost Baroque terrace flanked by the famous Bernini sculpture “Apollo & Daphne” and a pillar with climbing roses, and a Dutch Flemish still life of fruits and two birds. As the artist notes, “I don’t simplify the shapes. I get into the cracks and feel the structures and the stones. They are marks of cultivated wisdom rather than declination”. Pejman's style has also been likened to theatrical set designs by many art critics. Art critic Eileen Watkins, in her review of a Pejman Exhibition in The Newark Star Ledger, published in October 1995 stated, "Many of these works resemble theatrical sets, with the nearer elements framing dramatic vistas." In describing one of Pejman's works, she goes on to say, "Spring Time in Persepolis" features a ruined temple, its gray stone columns and walls carved with animals and soldiers. A slab in the foreground, however, displays spring flowers in a cracked vase, lush, dewy fruit and a colorful bird - the meticulous details suggest a 17th Century Dutch still life, but without the gloomy lighting." 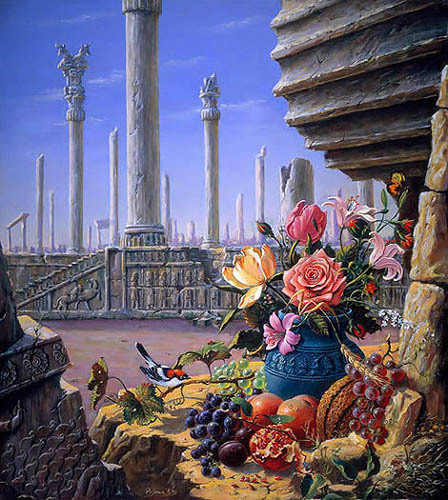 Pejman’s style from 1998 to 2007 is a romantic form of classical painting which the artist himself calls “Romantic Realism”. 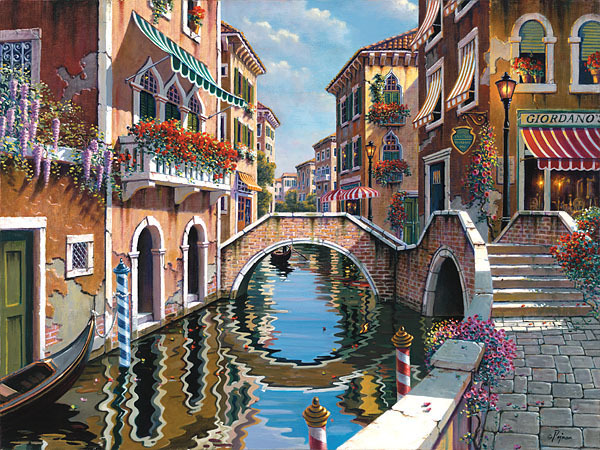 Some of the notable paintings from this period are “Rendezvous in Venice”, “Bellagio Village”, and “Morning Reflections”. These paintings share the common element of painstaking detail portraying idyllic European vistas. While many of the scenes and locales are real places, Pejman infuses his own artistic license to make already perfect scenes even more inviting. In further describing this style, the artist explains “I purposely refrain from putting people in my paintings. If there is no one there, you are free to imagine yourself within the painting”. 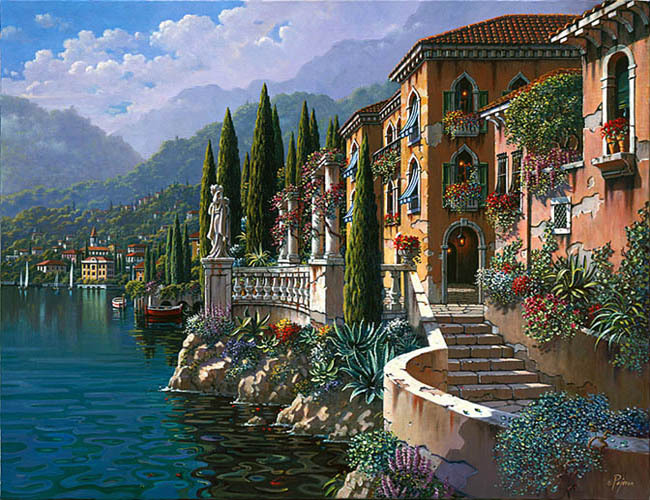 Consider one of the key paintings of the series, “Bellagio Village”. The scene of the village of Bellaio, Lake Come, depicted in this painting is perhaps the most recognizable of all of the Romantic Realism Series’ paintings. 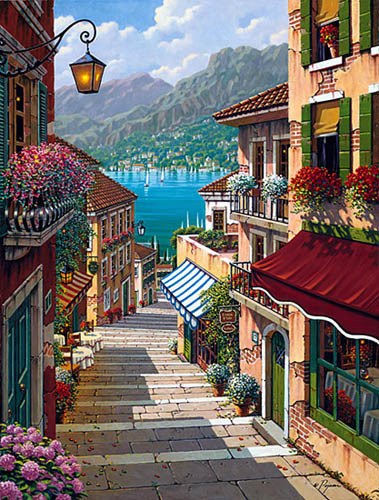 But yet, when compared to the actual scene, “Bellagio Village” contains additional layers of intriguing subtle elements that enrich this scene beyond its extraordinary beauty. 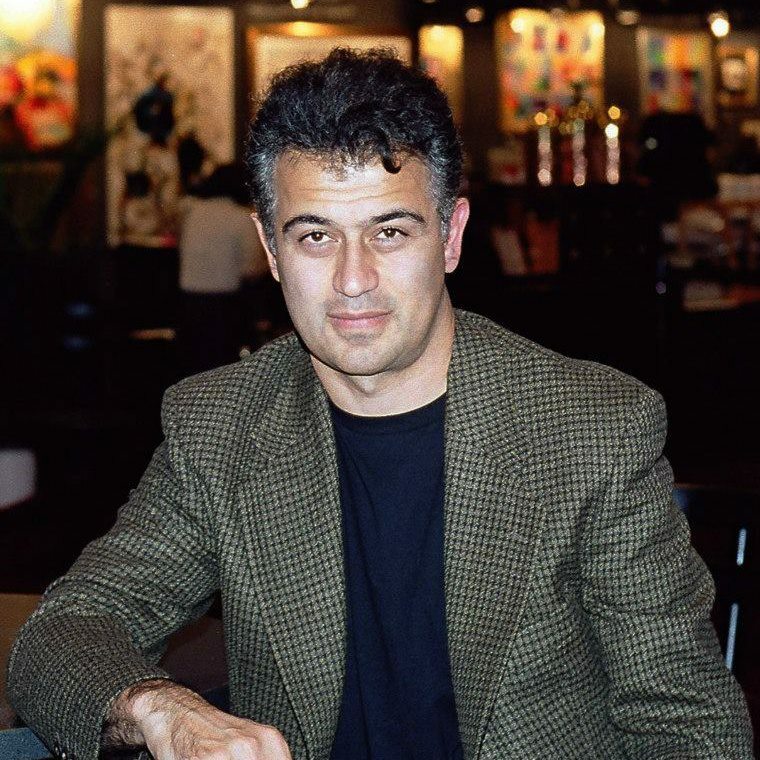 2007 marked a departure in painting technique for Pejman. Primarily known as a “realist” up to that point, the artist started a series of palette knife oils. 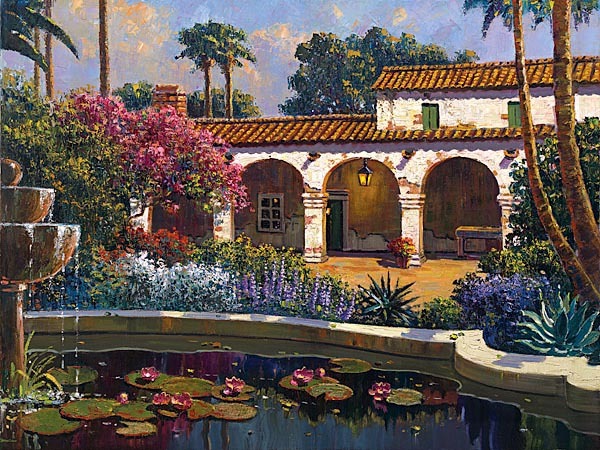 Notable in this series are works such as “Laguna Beach Stroll” & “Mission Reflections”. The motivation behind embarking on this new technique was to become more prolific and also to add the element of texture which was missing from his works up to this point. The previous classical and romantic realism works exhibited a flat surface painting technique and employed glazing techniques of the 16th and 17th century artists to achieve luminosity. The new palette knife pieces had much less detail but somehow showed detail thru the artist’s heavily applied palette knife texture. In 2012, Pejman expanded his loose palette knife approach to painting a loose but yet classical style with brushes. In describing the new style, the artist says, “It is very difficult for me to pinpoint or label this style. It is definitely an accumulation of years of painting and experimenting. The style is loose, yet it looks very classical. It has a hint of impressionism but it can not be called such. The one thing that I tried to achieve with this style is to get less commercial both in terms of subject matter and color. I try to stay away from the more typical settings and predictable color interpretations. 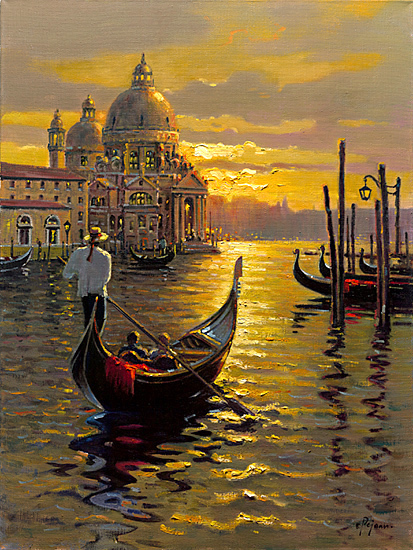 I have also gotten away from painting idyllic sun drenched scene with this style…..so I am experimenting more with sunsets, sunrises, and illuminated night scenes”.